Staff and volunteers with Food & Friends prepared 8,520 pounds of turkey, 1,065 pounds of roasted potatoes, 1,065 pounds of cornbread stuffing, 94 gallons of gravy and 5,680 dinner rolls. Oh and 1,420 pies. The meals go toward sick adults and children. WASHINGTON — In a building on Riggs Road in Northeast Washington, hundreds of volunteers have been working day and night to prepare massive quantities of Thanksgiving food and get it out the door. 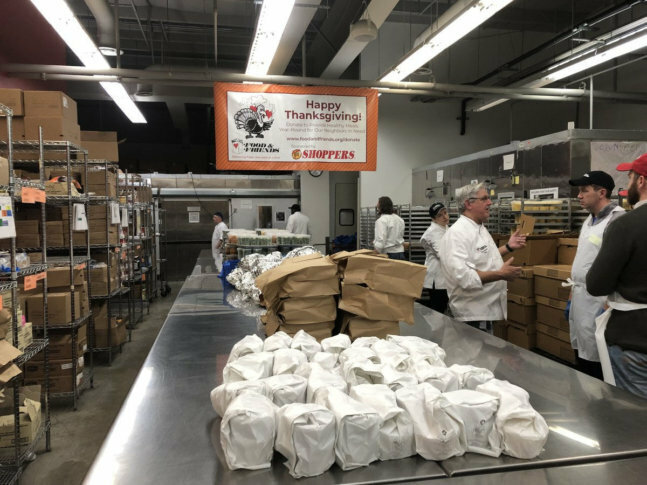 The nonprofit organization Food & Friends prepared and delivered 3,500 Thanksgiving meals to sick adults and children in the D.C. region on Thursday. Staff and volunteers helped prepare 8,520 pounds of turkey, 1,065 pounds of roasted potatoes, 1,065 pounds of cornbread stuffing, 94 gallons of gravy and 5,680 dinner rolls. There are also 1,420 pies. “It’s an important event for us,” Shniderman said. The group had 600 volunteers help with Thanksgiving. Food & Friends provides home-delivered meals year-round to people who have serious illnesses. The group serves the District, seven counties in Maryland, and seven counties and six independent cities in Virginia. Since 1988, the group has delivered more than 21 million meals to 31,000 people living with HIV/AIDS, cancer, diabetes and other life-challenging illnesses.